This fall my new additions are these vintage galvanized tubs. I looked long and hard for two that were still on their wash stands but never found a pair that I could afford. Oh my gosh are they pricey. So I decided to go with basic tubs and not only was it budget-friendly, but I think it was the right choice for my space. The tubs on the stands may have been too much. Even though I wish I lived in a farmhouse, the fact remains that I do not. These tubs add a bit of farmhouse without going over the top. I’ll be back soon to show you exactly how I put them together. The plan is to keep them going (and alive) all the way through Christmas. I hope it works out. I figure even if the ivy dies I can add some other sort of greenery later and all will be fine. 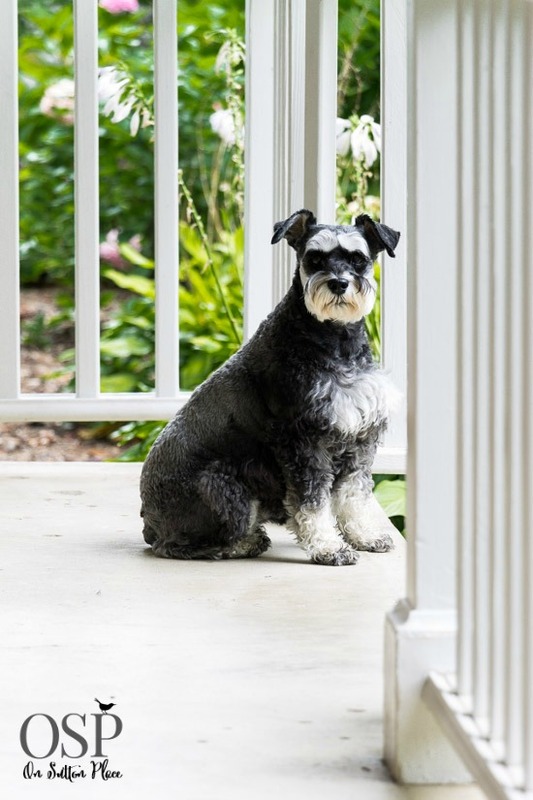 Here are the basic ways I add decor to my outdoor spaces. It may vary slightly with the season but not very much. The first thing to start with is someplace to sit. A swing, rockers, chairs. 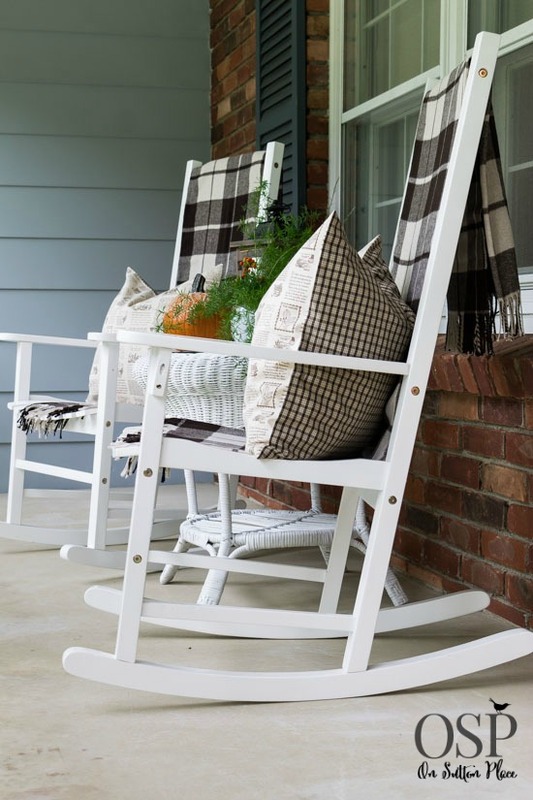 Even if you have a tiny front porch hopefully you have room to add a small bench or even a stool. If you have room for even one chair or bench, add some softness with fabric. A throw, pillows or a seat cushion…or a combination of any of the three. These brown plaid throws were my new addition last year on the back porch. This year they have moved to the front. The colors of Autumn are, in my opinion, stunning. 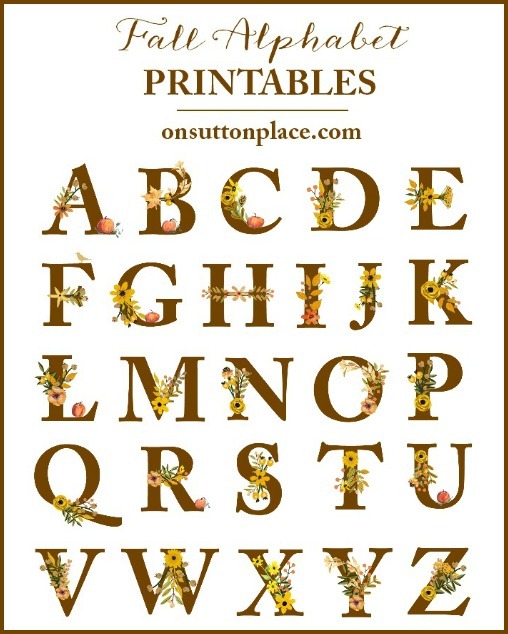 Include them in your fabric. Browns, golds, oranges, deep reds. Add a natural element. A pot of mums or something green like ivy. Depending on the size of your space, sprinkle the natural elements around. Something by your door…something in your sitting area. Next on the list is definitely pumpkins. 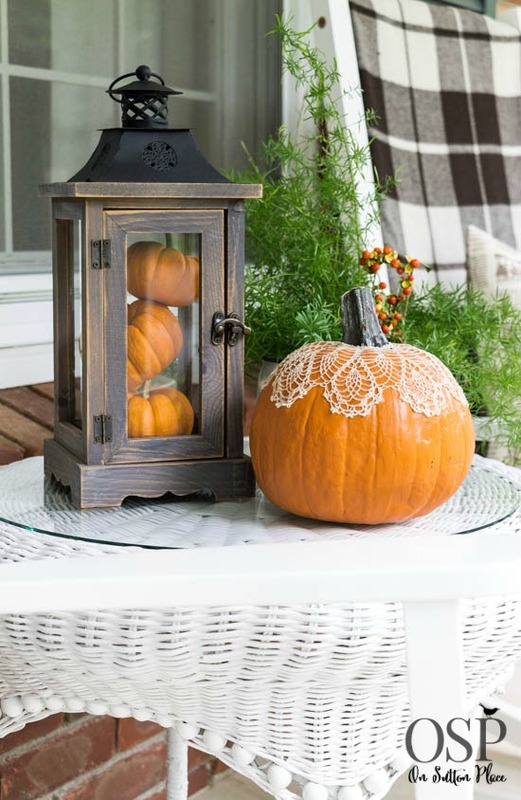 A Fall porch would not be complete without at least one pumpkin. I have a few small real ones and a few Funkins. When it gets closer to Halloween, I’ll put the Funkins away and replace them with the real thing. That’s basically how I do it with every season. Sometimes it takes a bit of planning and other times I just wing it. For this fall porch, I did plan the new tubs but everything else I already had. Once everything was gathered, it only took me about 30 minutes to put it all together. As always, my little helper was at my side. I don’t know if it’s a good thing or not, but since her attack, we have become almost inseparable. I guess it’s a natural thing so I’m trying not to dwell on it or worry about it. As some would say, it is what it is. I’ve put together as many sources as I could for things used on my porch. If there isn’t a source listed, it’s either vintage or no longer available. I’ll see you in a few days for my Fall Home Tour. 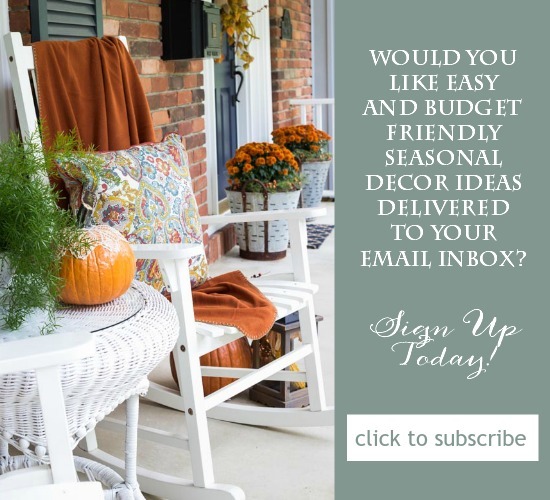 I’m joining an amazing group of DIY/Decor bloggers so be prepared for tons of inspiration. Enjoy your day! 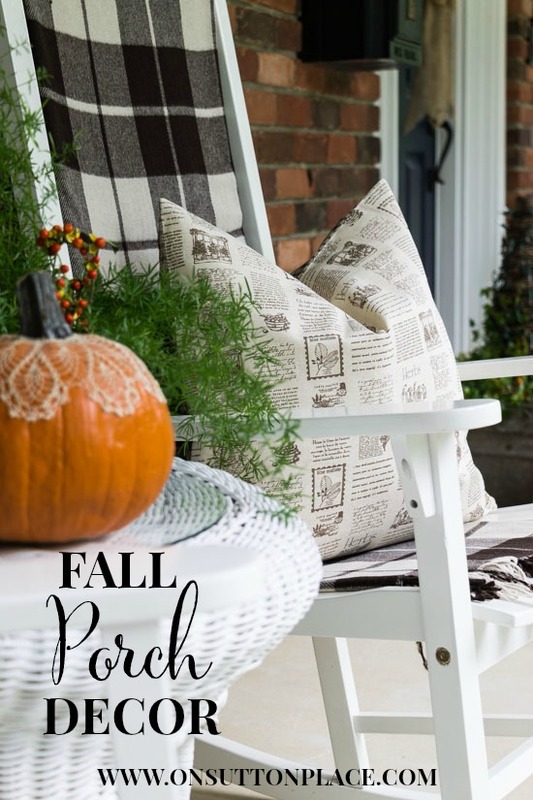 Click to see my Fall Home Tour! 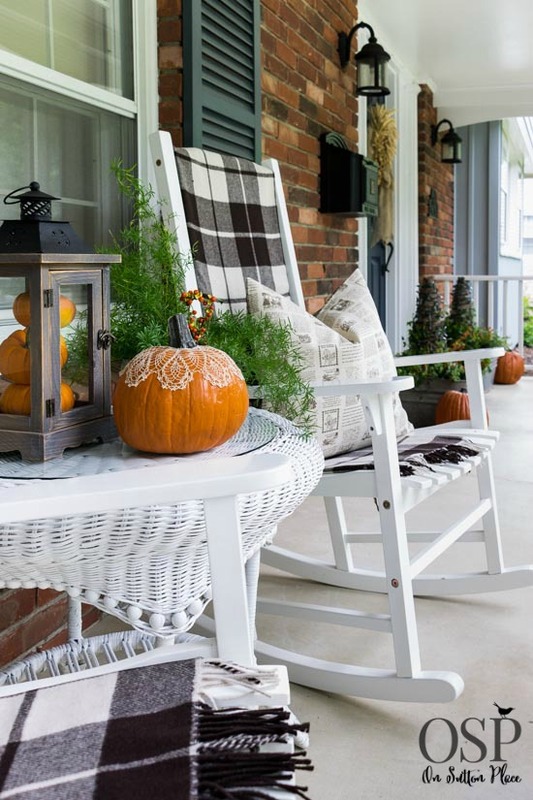 Lovely, lovely, lovely front porch for autumn! Thanks for the inspiration! I totally want to copy your pumpkins in the lantern idea. I’ve hooked to your link for the lights too. Always something new and I’d never have known without you!! So simple. Brown plastic!! Color of wood!!! And the doily. I buy real pumpkins for they end up being less expensive plus I love gourds!!! 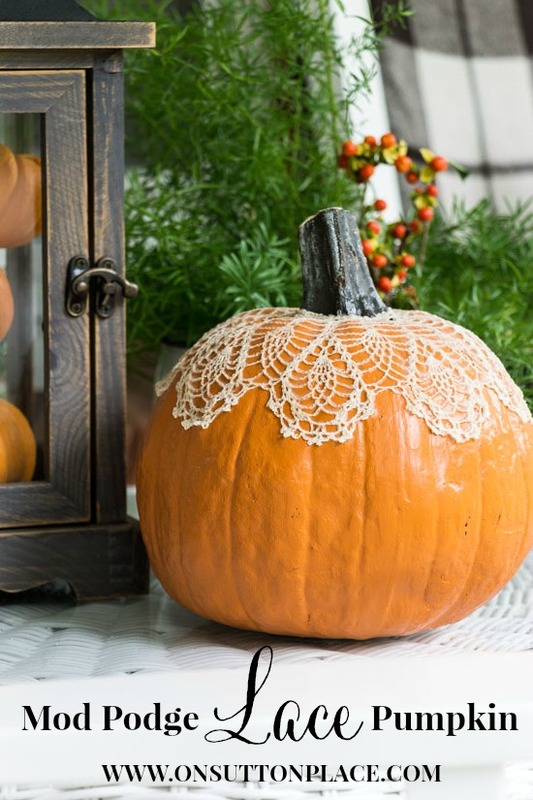 So inside I shall slip a doily over the top of a pumpkin…and reattach that stem with hot glue?!!! If you can’t slip the doily over the stem I think hot glue would work great! BEAUTIFUL Ann!! 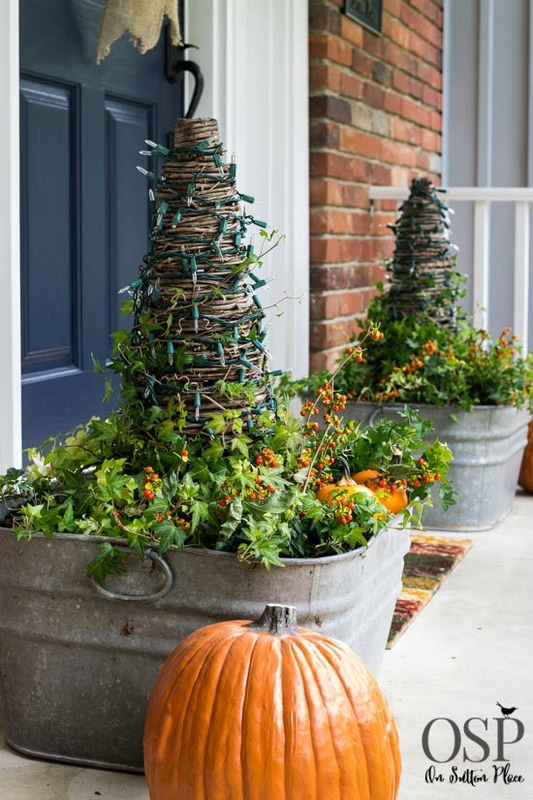 I love the galvanized buckets near your front door! You always dress your porch well. Love it all. Cozy and quaint…love your decorating style. Thank you for the decorating inspiration. Happy Fall! Love your porch décor Ann. Elegant and not over done. I’d like to come over for some tea and rock awhile :-) Great Job! 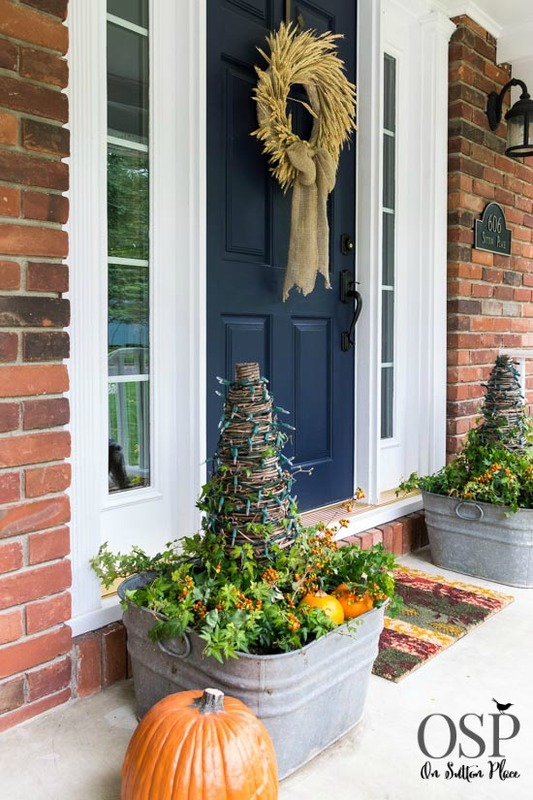 Your front porch always looks so inviting – whatever the season. Fall is my favorite season for decorating! Happy Fall! Like you, Ann, I wish I had a farmhouse. I can remember days being at my Aunt’s farmhouse making pies with her and berry picking with my cousins. I’m an only child so it was always great to have someone to hang out with. Enough reminiscing. Love the rocker, love the throw, love the pumpkins, I guess I love everything! I put out mums in some my planters and have my little rocker on my little porch. Well, when I came home the other day (my son is a landscaper) he had left a bale of hay on my porch and moved some of mums on top of it. It was so sweet of him. You know, sometimes they drive you crazy and they do something like that! Ya gotta love em! Oh my gosh that’s the nicest thing I’ve ever heard. Thumbs up for your son! It looks wonderful and ready for a set to snuggle,drink a hot drink,and watch leaves turn those beautiful colors. Have a great weekend. Ann, you’ve given me an idea! I have several collars my grandmother made for me; do you remember them? They were crocheted, and we put them on a pullover “banlon” sweater and wore it with a matching button up sweater. I’ve been wondering what to do with them. I think I’ll do a few pumpkins and put them on the hearth in the living room. Thanks so much; the porch looks wonderful. Ann, your fall porch is beautiful!!! I love the use of galvanized tubs at the door.I just might have to use that idea out my back door! I could tell your decor anywhere! It’s clean and fresh and so will done! I’m so inspired any time I stop by! I really like the galvanized tubs; the color is a nice offset against all those warm fall colors! Hi Ann, I love the porch ideas. I looked closely at the tree-like towers in your tubs. I love the idea of the lights on them. Because it is close to Halloween will these be witches hats? Oh Sherry that’s a great idea! Ann, your porch looks lovely! I often lament about the things I don’t have (such as a farm house or a bigger front porch) but you help me to remember to work with what I do have. Thank you always for your inspiration! I know Mary! Thank you for taking the time to comment. If I had a dime for every time I wished for something I don’t have I’d be rich! Your porch looks fantastic Ann. We are having rain and wind today and it’s blowing all the leaves from the trees, Im beginning to think fall may be gone here soon and winter will be rolling in. I love those tubs! Your porch looks wonderful Ann. 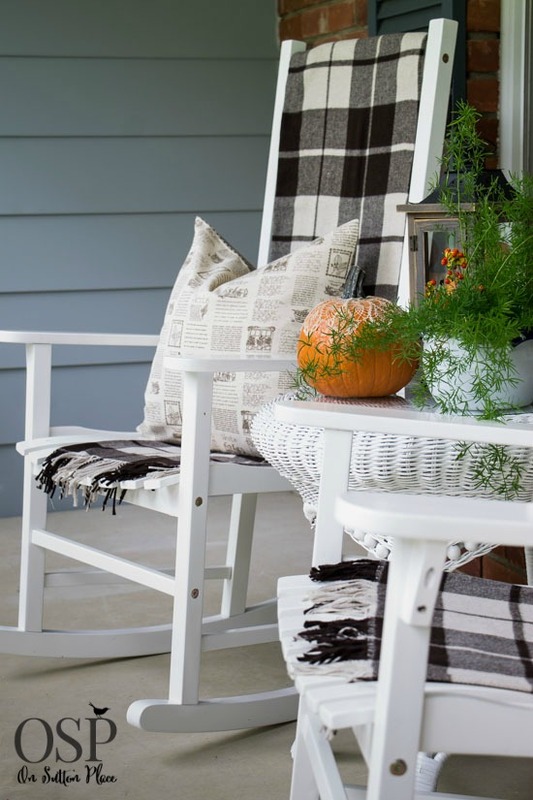 Love, love your fall porch. It was 94 here yesterday, (Hilsboro, Or.) we are ready for some fall days. Love the color on your front door, would you send me the color please. Such a beautiful porch. I loooove bittersweet. It used to grow nearby but now that I don’t live there anymore I really miss it. Th galvanized tubs and their contents are fabulous. I am planning to use a copper boiler that was my in-laws, and place my two ferns in it. We kept several large parts of our tree we had removed four years ago. I set pumpkins on them, add my scarecrow, cornstalks, and mums. Small, twinkling, autumnal colored lights on a timer highlight our small porch. I keep this visual from the beginning of autumn till my family dinner on Thanksgiving Day. What a pretty fall porch! I love all your clever touches–especially the lace pumpkin. Who would have thought that adding lace could make such an elegant transformation! Thanks so much for the inspiration! I really like that you tell where you got your stuff for decorating and I love your designs. I am not a decorator but I like looking at it. Helen Keller could live in my house comfortably. I am very sorry about your fur kid. Just like the rest of us, after a violent attach, her confidence is also a part of the injuries. You may want to work with a trainer to help her recover. Best wishes, and thanks for the décor ideas. I have been inspired! Wonderful Gift to us – Thanks!